Slash-and-burn cuts to the State Department and USAID would deepen the worst humanitarian crisis since World War II. NAIROBI — It gets more U.S. foreign aid than any other continent, the largest share of U.S. global health and disaster relief spending, and it hosts nine out of the world’s 16 U.N. peacekeeping operations — and four out of the five most expensive ones. 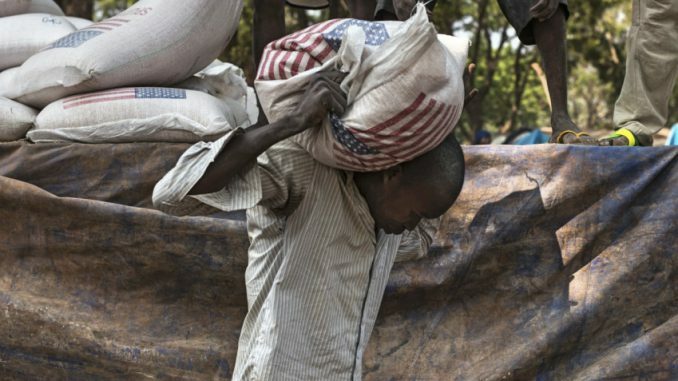 Sub-Saharan Africa is grappling with record levels of displacement and hunger due to conflict and drought, but President Donald Trump is proposing “deep cuts to foreign aid” that would hit this continent the hardest. According to the U.N., more than 20 million people are on the edge of starvation in just four countries, three of which are in Africa: South Sudan, Somalia, and Nigeria. Trump’s “skinny” budget blueprint, released by the White House last week, aims to slash the State Department and U.S. Agency for International Development (USAID) budgets by close to 30 percent, while eliminating several executive agencies, including the U.S. African Development Foundation, which funds grassroots development projects in 30 African countries. The cuts are supposed to partially offset a $54 billion increase in defense spending. In addition to gutting America’s most important diplomatic and humanitarian organs, Trump aims to cut funding for the U.N. and affiliated agencies. State Department officials have reportedly been instructed to eliminate more than half of the United States’ annual $10 billion contribution to the U.N., cuts that would drastically reduce the world body’s ability to fight hunger, disease, and war. The blueprint leaves intact funding for HIV/AIDS and malaria treatment, both of which are critically important for Africa. But it hints at deep cuts elsewhere in the aid budget, including to initiatives aimed at countering the effects of climate change, which is already affecting parts of the continent through coastal erosion and desertification. Until the Trump administration submits a more detailed budget proposal in May, it’s impossible to say which programs will be hit the hardest. Given that much of the State Department and USAID budget is fixed, however, it’s their discretionary spending on development and humanitarian relief that’s likely to get the chop, according to former USAID officials. The State Department and USAID together spent more than $8 billion on foreign assistance to sub-Saharan African countries in 2015, the last year for which there are data. (By comparison, Britain, the world’s second-largest bilateral donor, shelled out a little more than $3 billion.) Of that, they spent more than $1.13 billion on foreign disaster relief, including $717 million on Ebola response and hundreds of millions feeding and securing people in conflict zones like South Sudan, Central African Republic, and northern Mali. The administration doesn’t realize it yet, but they are going to call up AID when there is a major disaster that threatens the U.S., like Ebola, and say, ‘What can you do about this? The administration doesn’t realize it yet, but they are going to call up AID when there is a major disaster that threatens the U.S., like Ebola, and say, ‘What can you do about this?’” Natsios said. It’s not just disaster relief that is threatened by Trump’s budget. The cuts would wipe out much of the development funding that, at least in theory, should create sustainable economies that are less susceptible to future crises. At $28.2 million, the 2017 budget request for the U.S. African Development Foundation (USADF) is less than the cost of an Apache helicopter. But its provision of small, direct grants to grassroots organizations means that its programs benefit 1.5 million people, mainly in impoverished trouble spots in Africa’s Horn, Sahel, and Great Lakes regions. Trump’s blueprint eliminates USADF, meaning that dozens of development programs run by its African partners would come to a halt overnight. In South Sudan, where the U.N. recently declared a famine, that would mean terminating four sustainable agriculture programs that are worth a combined $670,000. More than 1,000 direct beneficiaries and between 5,000 and 10,000 indirect beneficiaries — mainly family members of those working on the projects — would be affected if USADF is forced to end its operations in South Sudan, according to Dar. Peacekeeping is another area that could suffer in the Trump era. The budget blueprint caps U.S. spending on blue helmet operations at 25 percent of the peacekeeping budget, which in 2016 was $7.9 billion. (This year, the U.S. contribution amounts to almost 30 percent.) Nikki Haley, the U.S. ambassador to the United Nations, has indicated that her office will undertake a mission-by-mission review of peacekeeping operations, suggesting that those in Africa are especially deserving of scrutiny. The missions in South Sudan, Central African Republic, and the Democratic Republic of the Congo have been roundly criticized for their failure to protect civilians and for the criminal conduct of their peacekeepers. Last year, at least 311 people were allegedly abused by U.N. peacekeepers, the largest number by blue helmets in Congo. In July, peacekeepers in South Sudan reportedly stood by as civilians were raped in full view of their compound. But part of the reason these missions have performed so poorly is that they’ve been deployed to places where there is no peace to keep. Cutting funding to these missions, nearly all of which are in Africa, will only make them less effective, Williams said. “Trump’s budget proposal reveals this administration’s slash-and-burn approach to the U.N. is ideological. It is not the product of a thoughtful review process carried out and then implemented to find sensible reforms. This is an attack on an institution based on prejudice and ignorance,” he said. The mission in Congo, which at $1.2 billion is the U.N.’s largest and most expensive, will be the first to come up for review during Trump’s presidency. Since American interests in Congo are less clear than in a place like Mali, where blue helmets have been drawn into a conflict with al Qaeda-linked militants, it will be something of a bellwether for peacekeeping in the era of Trump. If the budget proposal is likely to be watered down substantially before it is signed into law, there are more subtle ways in which Trump’s administration is already leaving its mark on humanitarian operations in Africa. The president’s temporary travel ban, which caps the number of refugees entering the United States at 50,000, has brought refugee resettlement operations on the continent to a sudden halt. Church World Service, which is contracted by the State Department to run the only resettlement support center in sub-Saharan Africa, laid off more than 500 employees in the wake of Trump’s executive order. The organization had set its targets based on Obama’s pledge to resettle 110,000 refugees; overnight it found itself with virtually nothing to do. Others in Nairobi’s massive aid worker community — the city serves as a hub for operations across East Africa — are feeling jittery about their jobs. Some, USAID contractors especially, are brushing up their résumés.